Marquis de Lafayette was a renowned 18th century French nobleman who has occupied a special place in the hearts of Americans since the Revolution. He left his life of privilege in France to help the American colonies fight their British overlords and in the process helped create and sculpt the fledgling country. With the help of Benjamin Franklin, Lafayette eventually reached the rank of Major General in the Continental Army and helped broker a peace treaty between France and the colonies in 1778. He also had a very close relationship with Commander in Chief George Washington. With all of this in mind, when the United States was invited to participate in the Paris Exposition of 1900, leaders thought a fitting contribution would be a statue of the Revolutionary War hero sculpted by Paul Wayland Bartlett. A novel and educational approach was used to raise funds for the statue: School children from all over the nation contributed small change to the Lafayette Monument Fund. 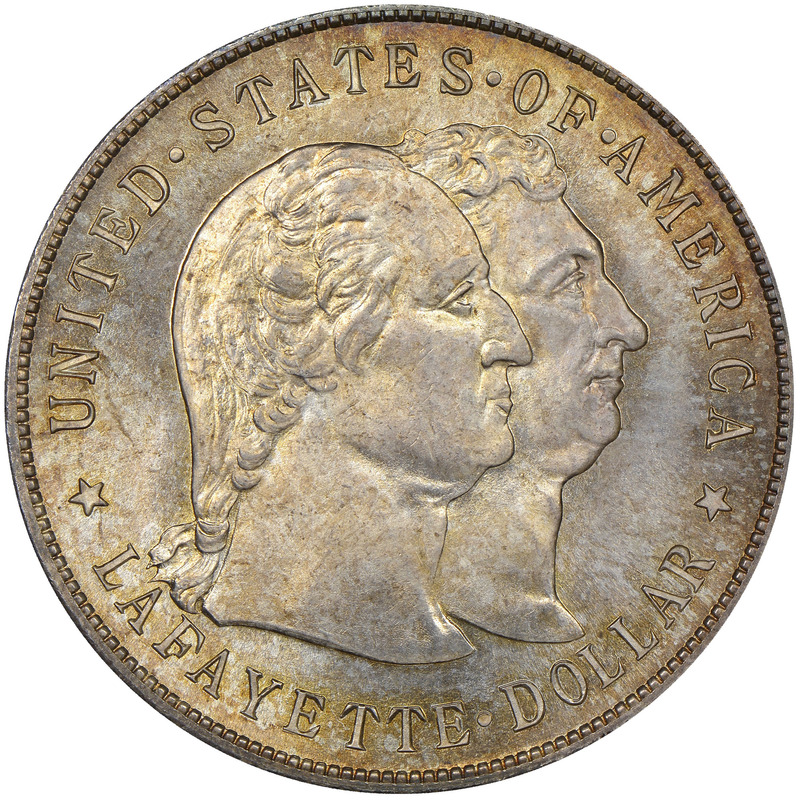 Additional funds were to be procured through the striking of 50,000 Lafayette commemorative dollars to be sold at $2 each. Chief Engraver of the Mint, Charles E. Barber, was selected to design the coin. Barber’s obverse bears a striking resemblance to an 1881 Yorktown Centennial Medal. 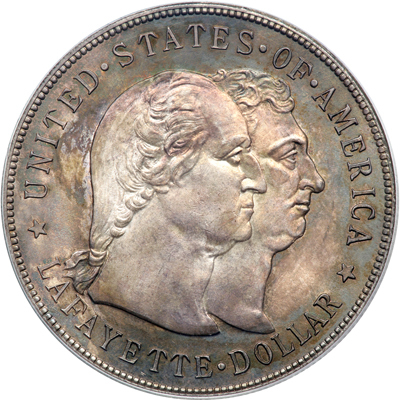 It depicts the conjoined busts of Washington and Lafayette. The portrait of Washington was created from the same bust used for the Washington Quarter 33 years later. 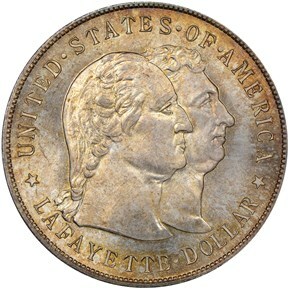 In addition to the portraits, the legend UNITED STATES OF AMERICA arcs above the busts at the rim, and the inscription LAFAYETTE DOLLAR arcs at the border below. 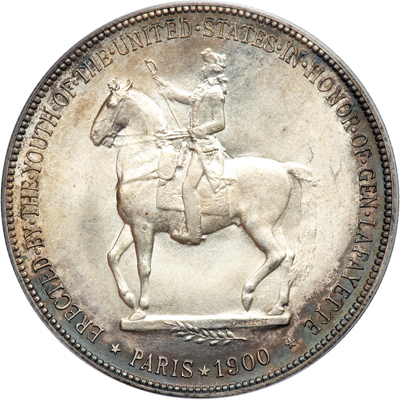 The reverse design depicts Bartlett’s statue of Lafayette on horseback. Bartlett’s name appears on the base of the statue. Encircling the border is the inscription ERECTED BY THE YOUTH OF THE UNITED STATES IN HONOR OF GEN LAFAYETTE PARIS 1900. 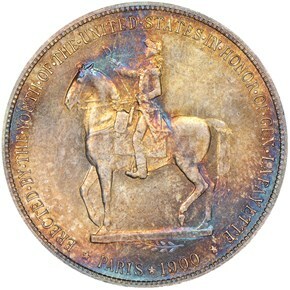 While the date 1900 is on the reverse of the coin, they were actually all struck in 1899. On December 14th, 1899, the mint struck all 50,000 coins as authorized by the legislation. This date had special significance as it was 100 years to the day of Washington’s death. Unfortunately, the coins proved to be slow sellers. After the Exposition, they were still available for a number of years for less than issue price. Eventually, some 14,000 pieces were returned to the mint, where they sat until being melted in 1945, leaving a net mintage of 36,000 coins. 5/1/2005 — I received a number of favorable comments about my column regarding the use of stars on United States coins. These included the suggestion that there was much more yet to be covered, so this month's installment will feature a further look at this "brilliant" subject. 3/1/2005 — Among the most common design elements on United States coins are stars. Many of the older USA coin types featured 13 stars, representative of the original states that declared their independence from Britain in 1776.